We actually gave this stunning book to my son (aged 6) as a Christmas present and it is such a brilliant book that I wanted to share some photos and details about the book. How Things Work (See Inside) (Usborne See Inside) is broken down into 7 sections. All sections (except for the first and last) are double pages. 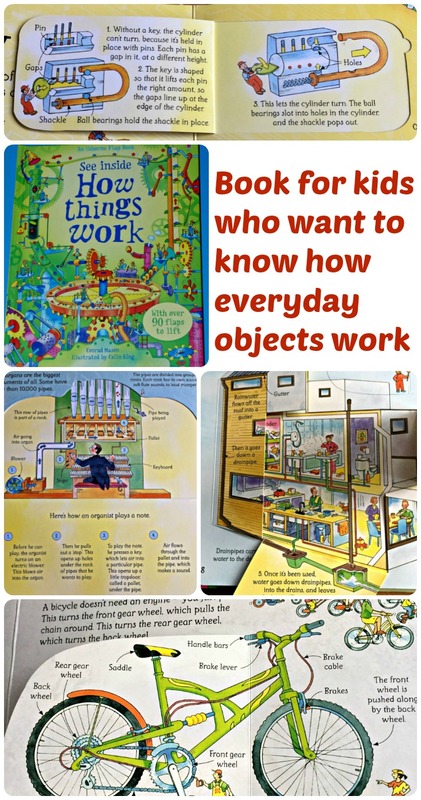 Simple machines – a quick explanation of a wheel, cog, pulley, an inclined plane, wedge, screw and a lever work. Movers and shakers – diggers, cranes and other items from a construction site. Getting going – cars and bicycles. My son really likes this page as it features how a car’s engine works and how a bicycle manages to move forward without an engine. Making music – how instruments work – includes a piano, french horn, trombone and a pipe organ. Waterworks. The kids see how the toilet and pipes in a house work. Floating and flying. Planes and boats. The graphics are of the high standard that you expect from Usborne books and they manage to explain how the items work in short, to the point phrases. I also really liked the fact that the book includes the items you would expect like cars, construction vehicles etc but they also included the water system in a house (I was not expecting this). This page has been the starting point for lots of discussions about toilets. I am a fan of the Usborne flap books because all the ones we own manage to keep the kids interested. The kids enjoy reading the books, lifting the flaps to see what is underneath and all the while they are learning. This one is exactly that. The kids enjoy it, they keep going back to it and every time they read it they are learning. I am thrilled we bought this book for my son as I think it makes a great addition to our home book collection. This entry was posted in Home education resources and tagged children's book, home education, homeschooling, science for kids, Usborne books. Bookmark the permalink. Looks like an engaging book!